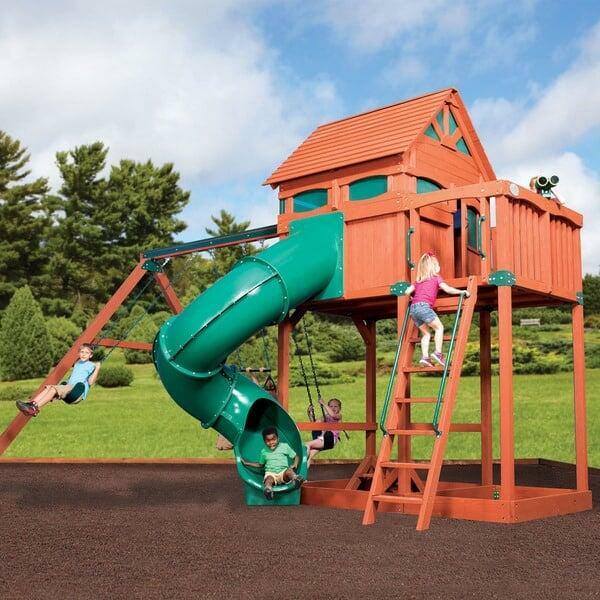 Backyard Adventures presents the best of both worlds with the Titan Treehouse III Play Set. The bi-level decks provide almost 45 square feet of playing space, and, at 6’ and 7’ high, your kids get that treehouse experience everyone loves. At the same time, the Titan Treehouse III Play Set can accommodate swings, slides, a rock wall, a trapeze bar and all those other accessories that will make this your kid’s (and maybe your) favorite place to spend the summer. The Titan Treehouse is not all fun and games, however. Backyard Adventures utilizes non-toxic, certified cedar construction which has a natural resistance to bugs, rot and decay. Engineered for safety and durability, the Titan Treehouse III has heavy-duty compression clamps and floor joists, as well as steel swing supports, heavy duty swing hangers, and marine grade rope. Invest in years of outdoor fun with the Titan Treehouse III Play Set by Backyard Adventures. The Titan Treehouse Jumbo collection features five different versions of the Titan Treehouse Jumbo. The Titan Treehouse Jumbo 3, featured on this page, is one of the more complex variations from the collection. Each Titan Treehouse Jumbo features a 7’ tall deck, a 64’’ x 64’’ deck size, and 4’’ x 4’’ vertical legs for supports. An accessory arm with three positions extends from the upper deck to house two belt swings and one trapeze bar. Each set also includes a 14’ slide. Beyond that, each set features different components for play. The Titan Treehouse Jumbo 3 features a balcony, a cabin and built-in binoculars. This setup is ideal for kids who enjoy playing with their imagination. The setting is ripe for different scenarios, like playing house, protecting a fort, guiding a ship and more. Bring the gift of physical and intellectual play to your backyard!